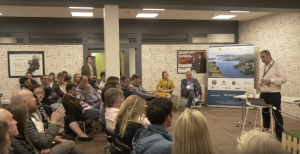 Serial entrepreneur Jerry Kennelly was the speaker as 50 entrepreneurs from the West Cork area attended the inaugural Ludgate First Tuesdays event, an exclusive networking event for entrepreneurs on the 4th of July at the Ludgate Hub, Skibbereen. It was the first in a series of events to be held at the Hub. Kennelly, who sold his stock photography company, Stockbyte, to Getty Images for $135m in 2006, gave his insights on a number of topics including the Irish business landscape, education and the jobs market, and shared what he has learned over the years with the audience, which was comprised of start-ups and more established business ventures. Mr. Kennelly noted that Ireland has seen rapid progress over recent years and, alluding to his own success, said that Irish business is set to grow even more on the world stage. “There are people who tell us we’re not far from the 1950’s or the 1960’s when Ireland was a 3rd world country, we’ve moved on a great deal and it takes time. It was a big deal when we sold to Getty in 2006 but it’s not such a big deal now, we regularly see €200m deals done and in 5 or 10 years it’ll be regular billion dollar deals. Kennelly outlined what advantages Irish business have, including the fact that we speak English and the low corporation tax rate which is “so important to us to build and strengthen our companies”. He also advised those present not to try and be something they’re not, even if they’re faced with doing business in a large country like the U.S. He said: “Be yourself, don’t try to be someone else. I didn’t ever lose the Kerry accent although I must say I had to work particularly hard with it in foreign countries so that they don’t think I’m speaking another language! It’s not all plain sailing for Irish businesses, though. 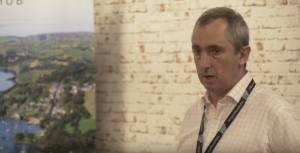 According to Kennelly, the Irish education system and jobs market leave a lot to be desired for digitally enabled businesses, answering “Yes” to an audience member who asked if the education system fails to provide graduates with the necessary skill set to thrive in the modern labour market. “I think there’s very poorly formed career choices. The parents of my generation and younger are suggesting that their children should work and become professionals, accountants, lawyers etc. and take the easy money. Software engineering and the whole digital space of making stuff from nothing is a really interesting career and not enough people are considering it. Certainly in my own personal experience I’ve been very disappointed to see the range of experience from some Irish software engineers, compared with foreign trained engineers. There certainly needs to be a recalibration to justify 3 or 4 years of investment by students and parents”. “I think it’s too long. I think a 12 month training period (straight after secondary school) is plenty and young people could come out and be earning 40 or 50k euro. By the time they’re 25, they could be the CTOs, they could be the rockstars. They’re messing around with two 13 week semesters a year, a couple of days a week, what a waste of time, what a waste of human capital. There’s only 1,300 graduates a year in computer science from the most recent figures available. There’s almost always 5,000 or 10,000 job opportunities open – but those great jobs are going abroad. Describing these problems as a ‘cop out by society’, he went on to question why we haven’t seen more change in this area. “Why would we do this? Why would we arrive at this point in our history and fail to take advantage of it? The fact that Ludgate exists here is an indication that people want things to change. Mr. Kennelly bemoaned the ‘serious problems’ that exist in tech spheres, saying that it is ‘abominable’ that we haven’t dealt with them yet, and hit out at the notion that global tech giants locating in Dublin is good for Ireland. “There’s a lot of talk about Google, Facebook and Amazon, all these guys are bringing lots of jobs to Dublin. In my opinion that’s a form of tourism, they’re not jobs. There are sucking resources in the city. Fair play to the IDA for bringing those guys in but we don’t get the benefits. It needs to be a balanced portfolio to ensure the best end result for Ireland. “I was in a big US tech organisation in Dublin recently and with over 1,000 people working there. There’s not one research and development job there, not one, so people don’t make stuff. You neuter engineers by making them service engineers. It’s appalling, and if we’re going to have any kind of success, we need to be making stuff. “Either for other people or for ourselves and if we can make stuff then that’s really valuable experience and if all the people in Google or Amazon or Linkedin were really making stuff and started doing R&D then that would be really valuable. I think we’ve got a huge bet on FDI and it’s noticeable that politicians don’t figure out that that’s very risky. “It’s the easy money and there’s a lot of factors that might change that in the future”, he warned. Kennelly then got into the nitty-gritty of running a businesses, and outlined “Jerry Kennelly’s Hard-Learned Lessons”, which were invaluable to some attendees at the beginning of their entrepreneurial lives. “The sales cycle is a really critical part of achieving success. It takes time to figure out what kind of bucket you put flags into, and figure out what bucket a flag goes into, how long you’re going to invest in a sales cycle and when you stop investing because sometimes it’s never ending. Kennelly continued, pointing out the 99% fail rate for entrepreneurs, and the dedication it takes to turn your business into a success. “People look at the Mark Zuckerbergs of this world, that’s the 0.000001%. Those guys work bloody hard, it takes a huge amount of commitment, it is a very competitive world and there’s lots of reasons for failure. Even a lot of the people who keep going are failing so it’s important to ask yourself the question before you get into this kind of venture; am I really up for it, am I competent? Kennelly briefly touched on criticism of Irish companies who exit in trade sales as he did, as against flotation on the stock market, explaining that it’s important to sell at the right time. “I don’t think there’s anything wrong with taking the money at a certain point. You bank it and move on. When I started I never had a huge interest in money, I still don’t to be honest, I was doing it for the craic. There is a time to move on and I wouldn’t listen to the naysayers.